Real Madrid got the 3 points from their delayed league fixture against Sevilla, after beating the Andalucia side by 2-1 at the Bernabéu. With Ronaldo still suspended, it was up to James and Jesé Rodríguez to step up and score the goals that allowed the Merengues to now go 4 points clear of Barcelona on the top of La Liga. Real Madrid and Sevilla have finally gone through their delayed league fixture in La Liga, and it were Merengues who came out on top after a very difficult 2-1 victory against Unai Emery's men. 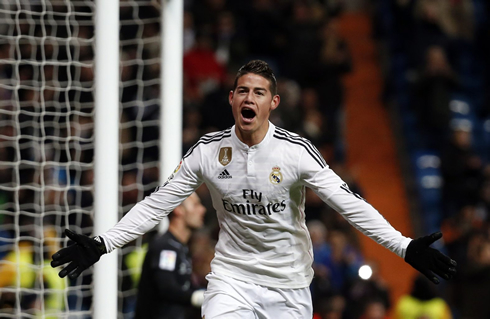 The hosts got off to a better start, taking the lead in the 12th minute after a great header goal from James Rodríguez. The Colombian's goal was followed by another good finish this time by Jesé Rodríguez, shortly after we had just gone through the first half of an hour in this Wednesday's match. However, the Merengues never really appeared to be very comfortable in the game and after having threatened to score in multiple ocasions, Sevilla finally got their goal around the 80th minute. Real Madrid held tight in the remaining minutes though and with a bit of fortune here and there, they made sure that they wouldn't be dropping any points tonight. Next Saturday there's an electrifying Atletico Madrid vs Real Madrid at the Vicente Calderón and the good news is that Cristiano Ronaldo will already be eligible to play, after having served his 2-game ban in La Liga. Carlo Ancelotti picked the strongest line-up available for tonight's match against Sevilla, making only a couple changes to the starting eleven that had played against Real Sociedad last Saturday. Casillas kept his spot in goal and had a back four in front of him formed by Marcelo, Sergio Ramos, Varane and Arbeloa (replacing Carvajal). In midfield, the change being made was the switch of Illarramendi for Khedira, who teamed up with Toni Kroos and Isco. With Cristiano Ronaldo still absent for this game, the attacking positions were unsurprisingly filled in by James Rodríguez, Gareth Bale and Karim Benzema. The Merengues would break the deadlock in the 12th minute of the first half, following a terrific cross from Marcelo on the left and an even better finish by James Rodríguez on the far post. The Brazilian full-back picked out his teammate with pinpoint precision and the Colombian attacking midfielder basically didn't think twice when he had to throw himself in the air in order to meet the cross and head the ball past an helpless Beto. Real Madrid's injury misfortune kept on and in the 27th minute of the first half, it would be time for James Rodríguez to also leave the pitch limping. The Colombian got injured in his foot and even though it might still be too soon to know how serious his problem is, it was enough for Ancelotti to feel forced to do another substitution and send in Jesé Rodríguez to take his place. It paid off 9 minute later though, as Jesé got to score Real Madrid's second goal on the night, after finishing off an attacking play that got initiated by Isco and Karim Benzema. After finding themselves falling two goals behind in the Bernabéu, Sevilla seem to have decided to increase their aggressiveness levels from that moment onwards and ended up seeing 6 yellow cards until the game reached its 80th minute. It was precisely then that the visitors finally managed to score their goal of honor, in a play where Real Madrid's defensive weaknesses were a bit too obvious and where Iago Aspas didn't facilitate by reducing the lead to 2-1. However, the scoreline wouldn't change anymore until the final whistle and Real Madrid were certainly happy to collect the 3 points against La Liga's 4th placed Sevilla. 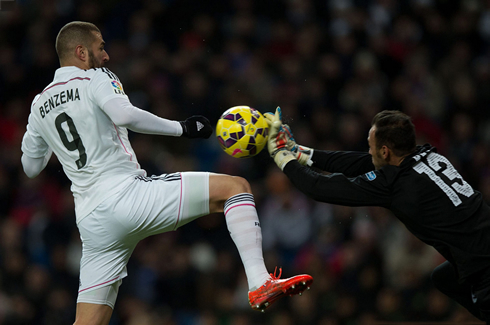 The Merengues are now 4 points clear of Barcelona and 7 points on top of Atletico Madrid. Next Saturday, there's a Madrid derby taking place at the Calderón and the stakes couldn't be higher, particularly for Diego Simeone's men. Cristiano Ronaldo might be back to help his teammates, but Ancelotti will have to rebuild most of his defense due to the injuries of Sergio Ramos and Pepe, as well as Marcelo's suspension. Cristiano Ronaldo next game will be for the Spanish League against Atletico Madrid, on the 7th of February of 2015. You can watch Juventus live stream, Atletico Madrid vs Real Madrid, Everton vs Liverpool, Manchester City vs Hull City, Tottenham vs Arsenal, and Aston Villa vs Chelsea, all matches provided from our live streaming game pages.